In our article LED spotlights we introduced some of the energy efficient options available to replace standard halogen spotlights. LED bulbs make for excellent spotlights, but unfortunately many homes have tens of halogen spotlights installed for general room lighting – something which current LED technology struggles to provide. For the best brightness, we have always recommended Cree LED spotlights, and for dimmability we have recommended the Megamann Dimmerable range of CFL (rather than LED) bulbs. Where the desire is to reduce electricity consumption without any compromise on brightness and colour, low- and mid-priced LED spotlights typically struggle badly. However, higher-priced LED spotlight bulbs are available which tick all the boxes such as those from the Lamina Sol range. Pictured above is a Lamina Sol dimmable LED spotlight (RL-16D2-E0540 warm white narrow flood MR16/GU5.4). With a power consumption of 8 Watts, it gives off a light equivalent to that from a 20W halogen (230 lumens at 26 lm/w), and it is rated to last 10+ years and 50,000 hours of usage. The input voltage is either 12 VAC from a standard low voltage lighting transformer, or 9 VDC (note not 12 VDC). The massive advantage of this bulb over the competition is its full dimmability. It also emits no UV light, and much less heat than a halogen equivalent. 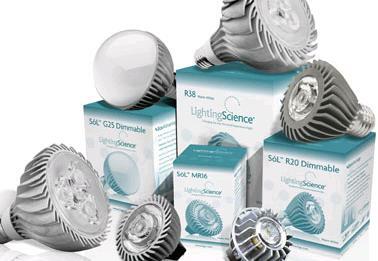 Therefore it can be used in always on situations, in areas sensitive to high temperatures, and also as a direct replacement for halogen bulbs currently used on dimmer switches. This range of bulbs is currently used by the likes of Cartier, Mont Blanc, and Radissons etc. 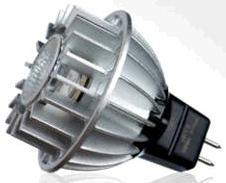 A similar, but non-dimmable GU10-based 230 VAC mains powered bulb is also available. Lamina Lighting Inc are manufactures of some of the brightest LED bulbs commercially available today. Click here to download and view the Sol MR16 Dimmable spec sheet (PDF), and Lamina Sol product brochure (PDF) from their website. Lamina Sol LED bulbs (along with a wide range of other high-end energy efficient lightbulbs are available from Professional Lamps UK Ltd.